As much as one third of all grain produced in the U.S. moves into export. In 2011 approximately $42.3 billion worth of grains and oilseeds were exported from the United States via this system. 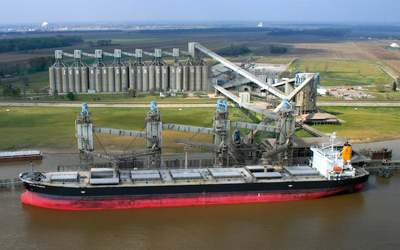 It is expected that over 100 million metric tons, of primarily U.S. corn, soybeans and wheat, were handled by the U.S. grain export system in the calendar year 2012. Annual volumes and value vary widely based on pricing, currency values, U.S. market access, and global supply and demand for the commodities produced in the United States.